Trees rely on root systems to provide water, nutrients and structural foundation. Without roots and the complex system of exchange and support they provide, trees would not be possible. Roots need two main things to be healthy; water and air. Of those two, water is the easiest to add. However it is less vital than air. In fact, too much water can be as detrimental as not enough for some root systems. This is where soil aeration comes in. With the use of special equipment, our trained experts will create additional pockets of air (called macropores) in the dirt, resulting in greater vitality for your tree. The amount of macropores can be affected by a number of factors, including the type of soil, soil compression and the slope of your land. Professional aeration can “fluff up” compressed soil and make it more healthy. If you’re in need of soil aeration in Fort Worth, Dallas or surrounding cities, give the pros at Integrity Tree Care a call. Our certified arborists are experts at lawn aerating services, so put us to work for you today. Compressed or compacted soil can be a major issue when it comes to the health of your trees and other plants. What causes it? Everyday life — anything from foot or vehicle traffic to mowing. Eventually, the soil gets mashed down more and more, which means there’s less room for water and air to flow through. It also prevents a tree’s roots from expanding. Lawn aeration helps by essentially letting the soil breathe again. With new holes, the soil loosens up and is once again a healthy place for roots to thrive. Integrity Tree Care, which was founded in 2001, strives to be the leading tree company in the area. 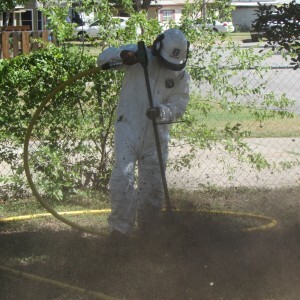 If you’re needing soil aeration in Fort Worth, Dallas or surrounding cities, we’re happy to help! Our mission is to not only provide you with excellent customer service, but to help educate you about proper tree maintenance. We take pride in our lawn aerating service, just as we do any job we perform. We look forward to taking your call!